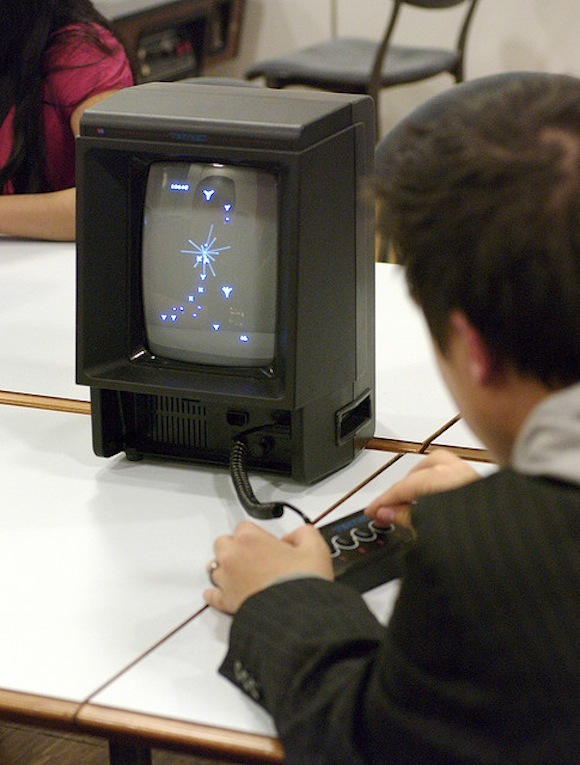 Human Vectors was created principally using the Vectrex—an absolutely unique home game machine that had a built-in calligraphic display. Calligraphic ('vector') display is a cathode-ray tube (CRT) technology that predates the traditional TV or monitor. In standard TVs, the ray methodically paints the full surface of the tube like a man mowing the lawn. It gets brighter and darker as pixels are lit up or not. In a calligraphic display, the ray traces the image out. It is great for line drawings, and terrible for fills. It has cute artifacts at the corners as it changes direction... By 1984, the Vectrex was a market failure and I bought a few for $50 each. Photograph by Kaspar Manz. (License). and the final shot employed an experimental color graphics card (TrueVision) with a 640 x 400 resolution and 8 bit pixels. Hot stuff at the time. The video was recorded on VHS by pointing cheap video cameras at the displays. My favorite cameras had laggy, smeary sensors. These were black-and-white security cameras bought from bins on Canal Street. The music in the video was by Soma Holiday, art-punk musicians who lived in what was then the disregarded neighborhood of Williamsburg in the ignored borough of Brooklyn. How disregarded? How ignored? Soma Holiday (A great French guy and his fine american girlfriend) squatted in the marble lobby of an abandoned bank. Human Vectors was selected for Basement Tapes. We told all our friends to watch and call, but few had cable TV. We watched from an apartment in Brooklyn where somebody had cable. The other contestants were all standard rock music and 80's Music Videos (fog machines, cars, babes). We won 5th place. Out of 5. The video did get heavy rotation at the Palladium (not yet an NYU dorm) and the cokey club that was a converted church—Limelight? But it was principally shown at Phil & Joanna's seminal RYO gallery in the then-quite-dangerous East Village. 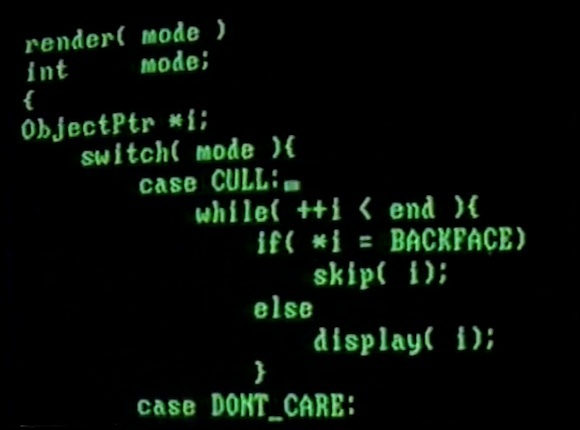 The video was made during the pioneering days of 3D computer imaging, and it references typical C code as well as seminal researchers such as James Foley and Andreis Van Dam. At the time, I was living in Staten Island with wife and baby, and working in the Time-Life Building on a completely different computer display system, as a game developer. 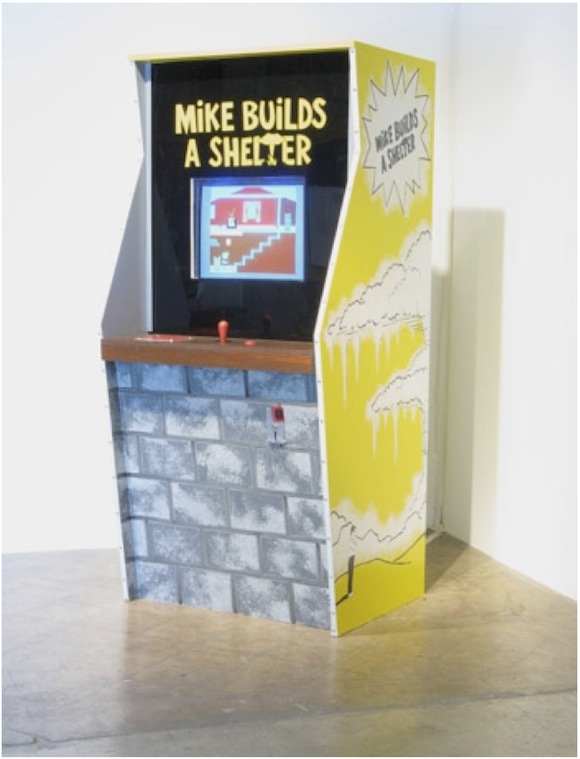 (About this time, Mike Smith and I made what the New York Times declared "the first videogame as fine art," Mike Builds a Shelter, which also showed at the New Museum). Michael Smith and Dov Jacobson, Mike Builds a Shelter (1983). 2008 re-creation of game cabinet with restoration of original software. Bill Ferster (partner) and I provided the 3D software (coded in the video) to pioneering animators and artists; in 1987, we sold our company to a big software company. With the new resources available (five programming teams and seven figure budgets) I launched a project to reproduce the brilliant Vectrex AnimAction system. The happy result, "Nimble," was sold in France and Japan but very bad business deals and Japanese/American rivalry killed it dead (except in France and in my studio in Washington DC). 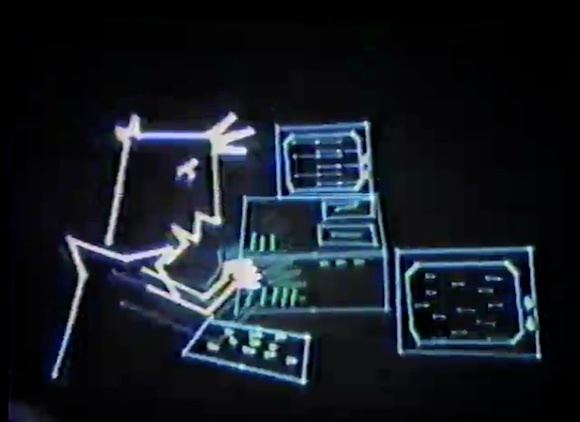 The Vectrex interface, which Nimble imitated, was more immediate and usable than standard computer animation paradigms. Still image from Human Vectors showing Dov tech stack used in its making. Clockwise-ish from top: monochrome display 80 characters x 40 lines, IBM PC weighing 20 lbs with fully loaded memory (640K), aftermarket hard drive (another 30 lbs and $10,000, for 10 Megabytes), color display 640 x 400 pixels, 8 bit color, fat keyboard. No mouse yet. Not shown:Vectrex, Vectrex lightpen, AnimAction game cartridge, video gear. Since making Human Vectors, Dov Jacobson has made a large number of games: art, commercial, experimental, propaganda and learning, as well as a couple of videos. Now, he lives in Atlanta and is currently Managing Director for GamesThatWork. He can be reached at Dov [at] BigFun dot net.